Celtic Wedding Band are members of Celtic Horizon Celtic Folk Band and Beggars Row Celtic Folk Rock Band and other Celtic Wedding musicians who create a truly Celtic Wedding Band atmosphere for your Special Day. For your Wedding day you can have a Celtic Wedding Band performing Wedding songs and tunes for your Wedding reception. During your Wedding ceremony you can have a Scottish fiddler perform Wedding Music before during and after your Wedding Vows. A Highland piper in full traditional dress can also perform for all your Wedding guests as they arrive at the Wedding venue and pipe the Bride and Groom into the service. A Celtic Weding Band can also perform for you at any stage of your big Wedding day and whatever your needs will be flexible to suit your happy occassion. Wedding venue's and location's no matter where or how unusual they may be are all considered. Soon also will be links to many Celtic Wedding dress suppliers and other Celtic Wedding band sites on our links pages. At most Wedding Ceremonies the beautiful tune The Highland Cathedral is performed on the Bagpipes and this tune can be specially recorded onto a CD with your wedding photo as a special souvenier of your big day. Enjoy dancing the Gay Gordons or maybe you prefer a Dashing White Sergeant then a Canadian Barn Dance. Some folk like a wee Waltz to a nice romantic Scottish love song. Or do you like it more informal and just like us to go like the clappers and make sure everyone is absolutely throwing themselves around like highland dancers meets John Travola or Riverdance. You would be surprised what we can get a wedding audience to do!-very surprised indeed! Step it out to a jig or reel! Dance a romantic waltz to Skye Boat Song or the Galway Shawl or many other beautiful celtic love songs. Or you can enjoy your meal to quiet Celtic tunes in the background. Please look at our other pages to see what other roles we can perform at your wedding of the year. Neil's favourite moment is when we get the audience to try and guess what set of Scottish and Irish tunes everyone is about to do the twist to! Be sure to get in touch and let us know what you think of our Celtic Wedding band web site! We will gladly discuss your wedding and fees with you-our estimates are free and without obligation. Should you have special ideas for your wedding or location we are willing to listen. Whatever you choose we wish you both a happy wedding and future! Oh by the way! I nearly forgot!,did I mention the surprises-yes the surprises,must not forget the surprises-yes must not-audience love them! Especially the one with the table in the middle of the dance floor-just as everyone is about to do the Gay Gordons as well-(bet they've never done it to that tune before! )-but it's the table and the one single chair that get's them curious-everytime-aye! but what about when they see what we put on the table-ha ha ! yes that's the best surprise!-definately yes-I must not forget the surprises!-the audience never ever forget the surprises-no never ever! It's amazing how many different tempo's and speeds you can do the same dance to!-very strange how the grannies manage to stay at the same speed even though the tune speeds up!-never mind they keep coming back up for more-so they must be enjoying it! 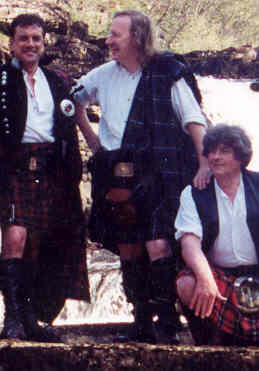 Bob and Neil are the two lead vocalists of International Celtic band Beggars Row.To go to the Beggars Row web site click here. Rob the Braveheart sings Braveheart songs dressed in Tartans like Mel Gibson in the film Braveheart.To view web site click here. 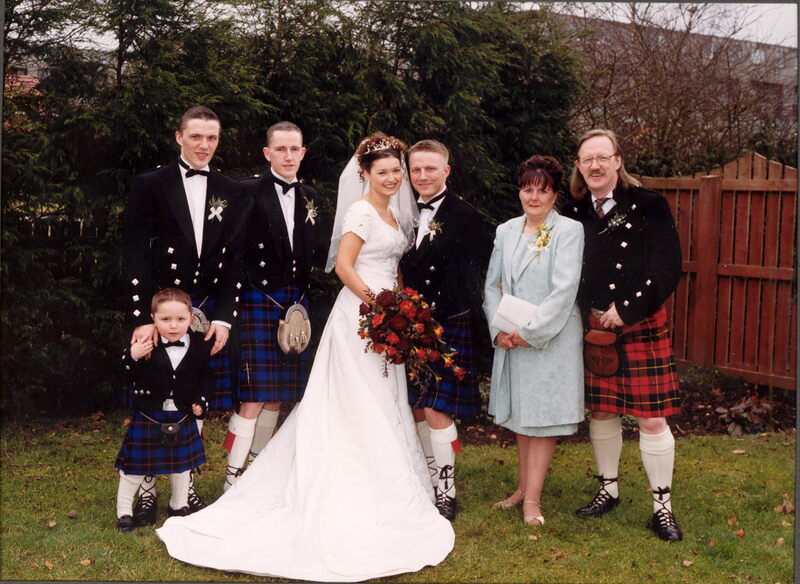 Celtic Wedding Band are available for Celtic Weddings worldwide.Dressed in their Tartan Kilts and Plaids they provide an authentic Scottish Celtic Wedding Band Atmosphere for your Special Celtic Wedding Day with Fiddles,Bagpipes and Romantic Celtic Wedding Band Songs and Music. Celtic Wedding Band Weddings are Unique and everyone who has booked us before say that all their guests and families state that Celtic Wedding band gives their Celtic Wedding Day something that other bands cannot provide. Celtic Wedding Band can give you a nice gentle Celtic Wedding Night for those wishing an easy pace or a Rip Roaring Celtic Wedding Party or a mixture of Both. Whatever, we promise Celtic Wedding Band will provide you with Fun,Romance and an unforgettable Celtic Wedding Experience. PLease Bookmark this page now so you can find us again!